No annual fee, no prepayment penalty! You can even use it to consolidate high interest loans at a far more attractive rate. Visit any branch, or call (616) 242-9790 to get started. *APR as of 1/20/14. Variable rate loan is .50% above Prime and is linked to Prime, rate subject to credit qualification. The maximum APR will not exceed 12%. Rate assumes autopay from a Lake Michigan Credit Union checking account. 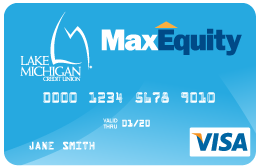 Home equity lines of credit and loans are only available for homes located in Michigan.